Michael’s Inn is a splendid boutique inn situated on the Niagara River. This ideal location allows guests to experience all the sights and sounds of the Falls, all so close that you can almost feel the mist on your face. 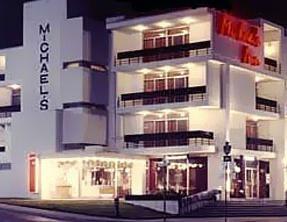 Michael’s Inn offers the finest accommodations with wonderful themed rooms and suites where fantasies come to life. Michael’s Inn has one of the best locations of all the local hotels in Niagara Falls, Ontario. This 3-Diamond Hotel is within 270 meters from the Falls and right next to the Rainbow Bridge. This allows guests of the hotel access to everything Niagara Falls, New York and Niagara Falls, Ontario have to offer by foot. Located along the Niagara River, Michael’s Inn is within sight and sound of the Falls, right next to the Rainbow bridge, and is ideally situated for guests who want to access everything by foot. This Niagara Falls Canada Hotel offers wonderful amenities such as the Great Barrier Reef swimming pool, a State-of-the-Art Fitness Centre, sauna and an oversized whirlpool. New features to the hotel include High Speed Wi-Fi Internet, a High Speed Internet Kiosk, ATM Machine in the lobby of the hotel and the Games Room with new Arcade Games. Michael’s Inn offers luxurious rooms and suites, some with spectacular balcony views of the picturesque Niagara Gorge and Niagara River. The spacious rooms offer unmatched charm and comfortable accommodations each beautifully decorated in a tastefully classic style. Guests are also encouraged to try out one of the great themed accommodations, such as the Scarlett O’Hara, or Midnight at the Oasis rooms. This restaurant is located in the lobby of the Michael’s Inn and offers dining for breakfast through to dinner. From a full a-la-carte breakfast to a romantic dinner for two, the Embers Restaurant is able to accommodate any type of guest and cater to their specific needs. Personal and unparalleled service is always provided to guests of The Embers. Open Hearth is a wonderful reataurant located in the Michael’s Inn in Niagara Falls, Ontario. Enjoy superb entrees created by the expert chef in full view of the guests to the Open Hearth Restaurant. At this Niagara Falls Restaurant the glass enclosed kitchen provides guests with a tantalizing view of the delicious choices being charcoal broiled on the open hearth spit or the new rotisserie.